Several days ago, I gave you a tutorial on how to recover from a borked glibc, using tools available inside the installed system. We mentioned booting into a live session as the last but always viable option. Then, I thought of a little snag that may come your way. What if the installed system uses LVM? Normally, you would just mount the root partition and then fix files and folders as needed. But what happens when you’re running LVM? The procedure as you know it no longer applies, and we need a new method. Let’s see what gives here. Note: Image taken from Wikipedia, licensed under CC By-SA 3.0 DE. Typically, LVM setups will have a small boot partition, which corresponds to /dev/sda1, and the the rest of the root under an LVM, which we can see falls under /dev/sda2 in our example. All right, naively, let’s try to mount it. The reason why this won’t work is because you’re trying to mount a container, much like the extended partition. So we will actually need to identify the mapped devices before we can mount them. We will now use LVM tools to manipulate this particular setup. 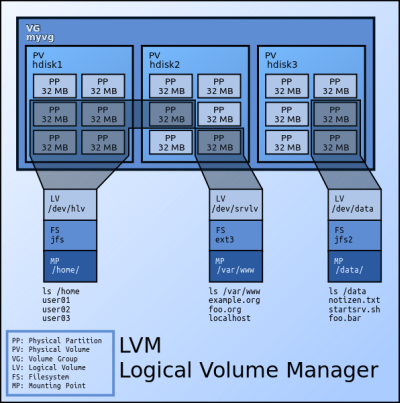 LVM consists of volume groups (VG) and logical volumes (LV). Or first task is then to identify the volume group(s) that correspond to the /dev/sda2 setup. So we need vgscan to achieve that. The tool will scan all physical volumes and then present the groups as new devices under the /dev tree. In our example, we have fedora, and this means that logical volumes that belong to this group will appear under /dev/fedora. This will succeed – again, provided your distro supports whatever filesystem you’re using for the LVM root volume. Once mounted, you can manipulate the partition and its objects like you normally would, any which way. This is a simple, quick tutorial. But it may save you some frustration. If you browse around, you will notice additional suggestions on running pvscan and vgchange, but you do not need those commands, especially if you do not intend to make any changes to the existing LVM setup – only the data stored on its volumes. The LVM manipulation trick completes the exercise we started with busybox and LD_PRELOAD a while back. It gives you the full range of options to fix your system problems. Knowing that you can always fall back to the live session usage, and work from there, should give you a sense of peace. It means that if you ruin your Linux, well not too stringently, you can use all sorts of tricks to get back in the game. But don’t push your luck. And keep those backups up to date. See ya.